UPDATED July 2: Revised deadlines for parental notification by the district with a school on The List (July 19) and for parents to notify districts of their intent to transfer (August 9). The sample parental notification letter is posted as well. Some of those rules have been released for public comment. And some we are still waiting to view. And oh yeah, school starts August 19. ADOR has issued basic guidance for parents and for Scholarship Granting Organizations (SGOs). 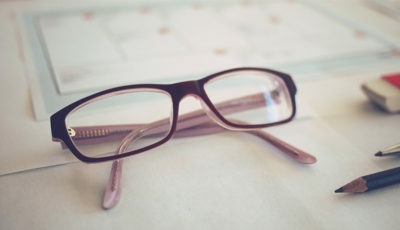 ADOR Guidance for the AAA Section 8, Parent-Taxpayer Refundable Tax Credits – This guidance includes the declaration that if students are already attending a private school, their parents are ineligible for the tax credit. Additionally, it declares that if the parent wants the tax credit, their child can only transfer to a nonpublic school that intends to participate in the Scholarship Program (accept students who receive scholarships from SGOs). 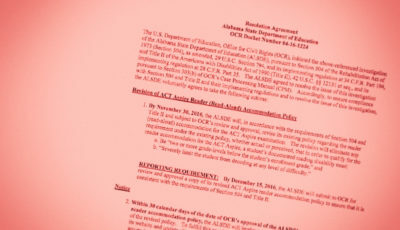 This means that the nonpublic schools must agree to administer an annual standardized test to the transferred student and report back to ADOR about the child’s academic achievement, among other things. Here are ADOR’s proposed rules.If you wish to provide feedback or input about these rules, the time is now. The comment period ends on August 8, when the public hearing will be held on these rules. According to the ADOR web site: “All interested parties may present their views in writing to the Secretary of the Alabama Department of Revenue, Room 4131, Gordon Persons Building, 50 N Ripley Street, Montgomery, Alabama 36132.” In other words, speak now or forever hold your peace (at least until next legislative session when there will most likely be some adjustments to the AAA). Just this morning, forms were made available for SGOs and Non-Public Schools to notify ADOR that they intend to participate in the program. Scholarship Granting Organization: Notice of Intent to Participate – ADOR will list all qualifying SGOs on their web site on August 1. Non-Public School: Notice of Intent to Participate in Educational Scholarship Program – ADOR will list all nonpublic schools that are approved for participation on their web sit on August 1. The ALSDE has not released their proposed rules regarding the AAA, and this is where the rubber really meets the road, in my opinion. Rule proposals were discussed at the June 27 State Board of Education (SBOE) work session, but were not included as a part of the packet of handouts given to attendees. Presumably these will be discussed at the July 9 SBOE combined work session and board meeting. Once the SBOE votes to adopt them, those rules will be available at this link (look under the July 2013 link). At that point, the same process will be followed as for ADOR’s proposed rules. The proposed rules, forms, and guidance that have been made available is helpful, but the timing of it all is very disappointing. Too many overlapping deadlines and too little time for parents and families to really utilize the intent of the law as passed by the Alabama legislature in May. State Superintendent Dr. Tommy Bice asked all districts in which “failing” schools are located to notify parents by August 1. He also stated that parents of children in schools on The List must notify their “failing” school of their intent to transfer by August 1. But the list of nonpublic schools that have been approved to participate won’t be available until August 1. So parents and families are supposed to receive the formal notification on August 1 and use the 24-hour period (assuming the list of approved nonpublic schools is available at midnight and parents and families start working at that point) on August 1 to make a decision about where to send their child to school? Really? And parents of children who will need scholarships to pay tuition will have to do triple-duty on August 1: (1) find a nonpublic school that is approved and (2) find an SGO that will grant their child a scholarship and (3) get scholarship money approved for their child. UPDATE: July 2: Superintendents of schools on The List have until July 19 to notify parents. Parents have until August 9 to notify their school of their intent to transfer. 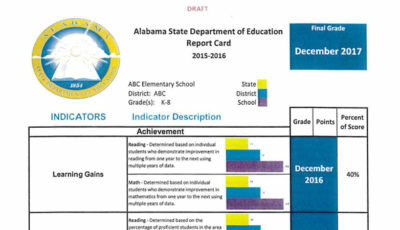 The ALSDE did provide a sample letter of parental notification for the district. This virtually assures that no child who attends a “failing” public school will have a viable way out of that “failing” public school this year based on the provisions of the AAA. Regardless of how you feel about the AAA, The List, and the whole idea of school choice, the way this has been handled, administered, communicated, unveiled….you name it, none of it was done with children and families in mind. As Bice said at the SBOE work session, “The timing of this, this first year is going to be somewhat odd…compared to what it will look like in years forward.” He added that they are having to make all of this happen in a “condensed fashion” at this time. Bice said in the future, the rule they are proposing is that parents will be notified by January 1 in order to make a decision about their child and notify the school of their choice to transfer by March 1. Presumably all of these rules will be revealed at their next meeting. The ALSDE’s sample letter of notification will be sent to parents and families explaining their options some time this week. I hope it paints a simpler and clearer path for parents and families who wish to take advantage of the process the Alabama state legislature set in motion. I will publish it when it is released. Update, July 2: Here it is. A student transfer form was also distributed to those school districts with schools on The List. 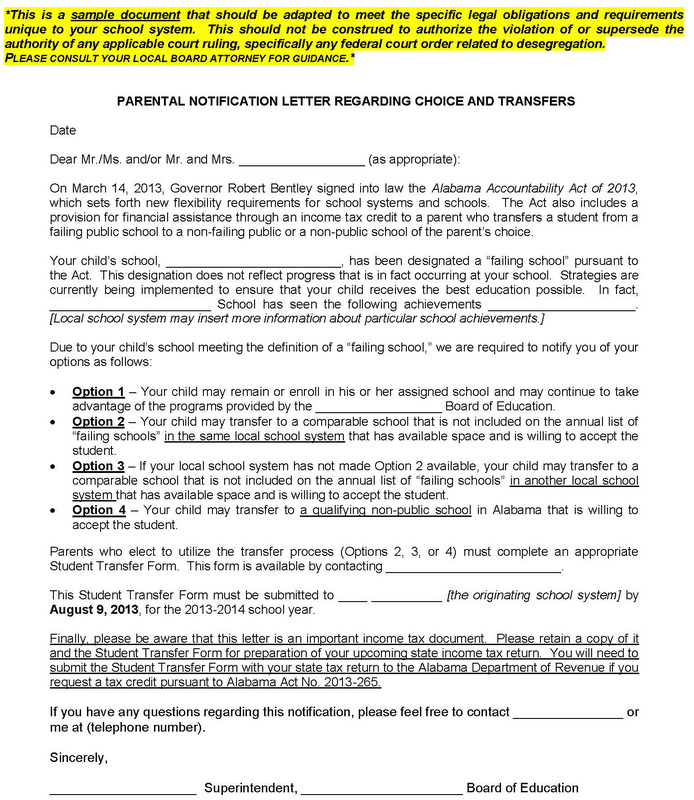 It is a simple form that requires parents to obtain an official signature from a school administrator at the school to which the child is transferring. Parents must return those signed forms by August 9. If you have strong feelings about the proposed rules, you should take the time to let ADOR know your concerns. You can do that either in writing (Secretary of the Alabama Department of Revenue, Room 4131, Gordon Persons Building, 50 N Ripley Street, Montgomery, Alabama 36132) or by showing up at the public hearing in Montgomery on August 8. 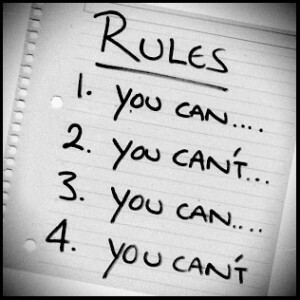 These rules must still be considered by a panel of legislators, who could choose to block a rule or otherwise alter it. 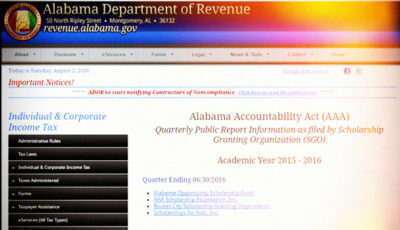 After July 9, take a look at the rules proposed by the ALSDE as well. I will share them here when they are released. As always, let’s discuss either here or on the facebook page. If you’re not on facebook, share your thoughts via e-mail to asc(at)alabamaschoolconnection.org.